The Henley Group has been in business since 1979. 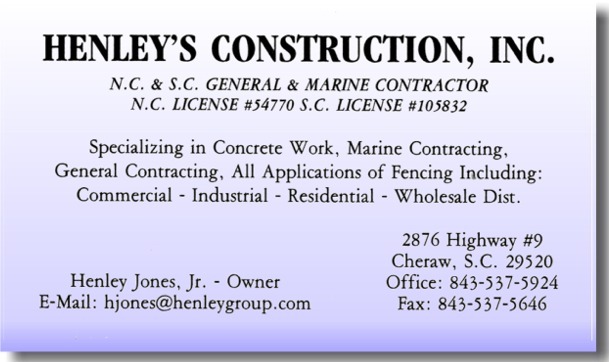 Headquartered in Cheraw, South Carolina, we are a SC/NC licensed General Contractor and a SC licensed Marine Contractor. We currently have two divisions. Jones Fencing can service all of your residential, commercial, and industrial fencing requirements, while Henley's Construction can meet all of your commercial construction needs. We offer competitive rates and free estimates on any fencing, marine, or general building project.